Identify the letter that indicates the opening of the pharyngotympanic tube. Identify the letter that indicates the uvula. bacteria, pollen, and viruses towards the pharynx. rings that allow the trachea to bend and elongate but not collapse. Identify the letter that indicates the trachealis muscle. Identify the letter that indicates a muscular tube that propels swallowed food to the stomach. known as the "Adam's apple." Identify the letter that indicates the vocal fold, or true vocal cord. Identify the letter that indicates the vestibular fold, or false vocal cord. Identify the letter that indicates the cartilage that anchors the vocal cords posteriorly. Anatomical region of the nasal cavity containing nose hairs. Alveolar cells that allow rapid diffusion of respiratory gases. The serous membrane lining of the wall of the thoracic cavity. The region of the lung served by secondary, or lobar, bronchi. Fluid that reduces surface tension of the alveolar walls. The medial opening between the vocal folds through which air passes. Specific location within the lungs where gas exchange occurs. Fissure separating the upper and middle lobes of the right lung. Which part of the nose is composed of dense fibrous connective tissue? 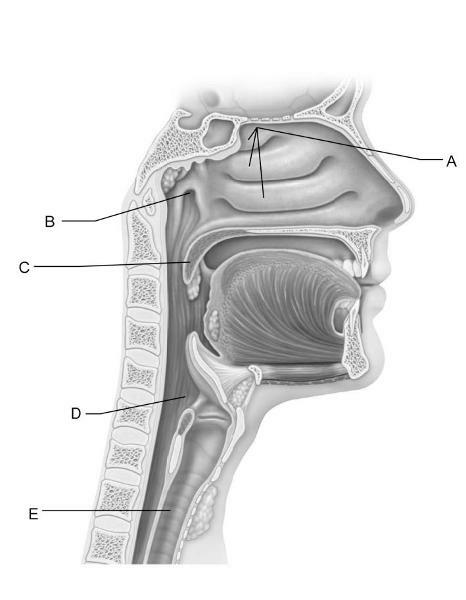 Which structure is not located within the nasopharynx? Which of the following is not a function of the nasal conchae? A) They deflect particulates to the mucosa. B) They help warm the air. C) They decrease the turbulence in the flow of air through the nasal cavity. D) They moisten the air. the thoracic cavity ________, and air flows ________ the lungs. A) the smooth muscle fibers around the bronchioles. B) the epithelium lining a large bronchus. D) lymph nodes in the lung. A) specialized cells in the larynx that react to vibrations of air. B) large hairlike projections on epithelial cells that line the trachea. D) the sensory organs of the inner ear. Which muscle contracts during forced expiration? B) a decrease in blood supply to the bronchioles. D) secretion of less surfactant. B) is supplied entirely by a secondary bronchus. C) receives oxygenated blood from the heart via the left pulmonary artery. D) has a cardiac notch. What type of epithelium occurs in the respiratory mucosa? bronchus," and "right middle-lobe bronchus." These are ________ bronchi. A) arbitrary subdivisions of a lung, about as large as a fist (0.3 liter). B) parts of the lung that are easy to remove during surgery. C) parts of the lungs that are separated by the oblique and horizontal fissures. D) parts of the lung that are supplied by a single tertiary bronchus (and its branches). The ________ flaps over the glottis when we swallow food. A) ciliated epithelium and mucus that line the respiratory passages. B) abundant blood supply to the nasal mucosa. C) porous structure of the nasal conchae. D) action of the epiglottis. A) the force of air passing over the vocal folds. B) the tension in the vocal folds. C) the size of the laryngeal cartilages. D) the shape of the cricoid cartilage. 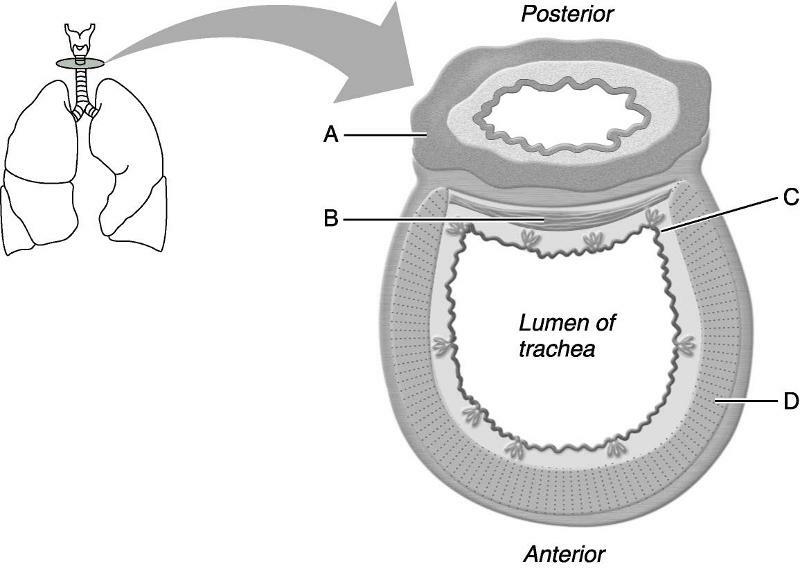 In the wall of the trachea and bronchi, the cartilage rings lie within which tissue layer? A) sense the concentration of oxygen and carbon dioxide in the blood. B) give rise to the pulmonary arteries. C) are innervated by the glossopharyngeal nerve. D) are in the hilum of the lung. A) paralysis of the diaphragm. C) complete loss of speech. D) inability of the carotid sinus to monitor blood gases. B) to replace vessels broken in nose bleeds. C) to supply extra blood to the brain and supplement the dural sinuses. D) to warm blood and moisten inhaled air. B) controls the length and tension of the vocal cords. C) initiates the cough reflex. D) raises the larynx when swallowing. A) scattered throughout the pharynx. D) synonymous with the adenoids in the roof of the nasopharynx. A) invagination of the ectoderm of the olfactory placode. C) a cranial extension of the mouth. D) the early precursor of the paranasal sinuses. A) they all have slightly different colors. B) they are separated by fissures. C) each is supplied by a primary bronchus, and the primary bronchi are easy to find. A) allow gases to transfer from the alveoli to the blood. B) allow pleural fluid to enter the alveoli and keep their walls from sticking together. C) are the openings between the alveolar duct and the alveolus. D) equalize air pressure throughout the lung. Which structure does not enter or exit from the hilum of a lung? C) open as far as possible. D) all the way closed. Which muscle is used for both quiet inspiration and forced expiration? 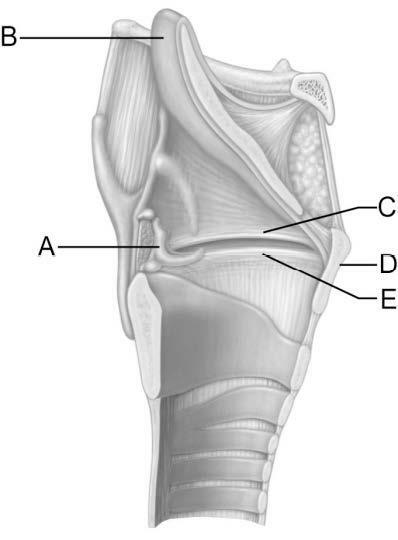 A) Cartilage rings are replaced by irregular plates of cartilage. B) The lining epithelium thins. C) Elastin in the walls disappears. D) Cartilage disappears in the bronchioles. In a preserved cadaver, the first rib is likely to form a groove on which surface of the lung? The trachea, bronchi, and bronchioles are all located within the lungs. Changes in the size of the thoracic cavity bring about inspiration and expiration. Gas exchange occurs across the bronchi and bronchioles. The left lung has both a horizontal fissure and oblique fissure. The pleural cavities extend two ribs below the inferior border of the lungs. The external intercostal muscles are involved in active inspiration. The groove through which air passes between nasal conchae is called a choanae. The respiratory zone begins at the large bronchioles. The only laryngeal cartilage to form a complete ring is the cuneiform. When the diaphragm contracts, it raises the floor of the thoracic cavity upward. The scalene muscles are involved in deep inspiration. The vocal ligaments are attached between the cricoid and arytenoid cartilages. the path to the respiratory bronchioles.